A hundred years ago, a little garrison town in peace time. Life for the out-of-work soldiers is extremely monotonous. The locals have locked up their daughters and there are few distractions. They are seriously bored. So they sit indoors and natter. What do people talk about when they are horsemen? About horses, of course, and how bad they are. About officers, and how useless they are, and about the rules, and how idiotic they are. They put the world to rights. It passes the time. The story which I am about to tell you happened in a garrison in a charming village in the Ukraine, Lubny, where the 26th Regiment of Dragoons of the Tsar’s powerful army is stationed. The nearest big towns, Poltava to the east and Kiev to the west, capital of what was then called “Little Russia”, are several days’ march away. And then some! At this time of year the roads are impassable. It is the end of 1888. The autumn manoeuvres have just finished, and Lubny is already under snow. Normal life in the barracks has resumed. God, but the evenings are long! This evening, fortunately, Sub-Lieutenant Mikhaïl Vassilievitch Asseyev is in fine form, livening up the officers’ mess. This young man, barely 25, is a brilliant horseman. He has a family tradition to uphold: his father commanded a battalion of Cossacks. The son left the Elizabethgrad School of Cavalry with the mention, “Very good”. For nearly four years he’s been in charge of a detachment of cavalry. Did he have a little too much vodka? Normally so reserved, tonight he’s full of passion. Not usually a talker, all of a sudden he’s eloquent! His friends listen to him, stunned. A burst of laughter shook his audience. Sarcastic remarks, jeers and ironic questions were fired at him from every direction. For the remainder of that evening the officers of the 26th Dragoons of His Imperial Majesty had to content themselves with Ukrainian vodka…. The following day, Asseyev started laying his plans, which proved that he had not made his promise under the influence of alcohol. He would leave in Spring, during his time off, and at his own expense. He would travel in a straight line from Lubny to Kiev and from Kiev to Paris. He would take two horses: his usual mare and a horse chosen at random from the army stables. Easier said than done! There were still plenty of sceptics in the regiment. Deep down inside himself, Mikhaïl Vassilievitch himself did wonder if he would be able to do it. But there was no question of backing out. At dawn on 16th April 1889, Sub-Lieutenant Asseyev, now off duty, left Lubny with the firm resolve of getting to Paris! He was riding Diane, his faithful dark bay mare, aged 4, easily recognisable by the two white stockings on her hind legs. She was a little crazy, like all good Anglos (she had both English and Don blood). 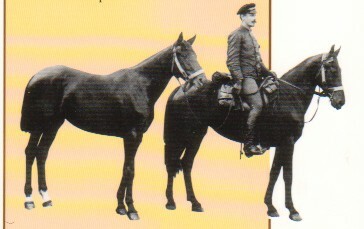 He was leading Vlaga, a 7-year-old bay mare, whom he had virtually never seen before in his life, and who had been willingly sold to him for the normal price of a remount. He had had them shod the day before by no less a person than the master farrier of the regiment, Anton Yeffimov – he must surely have been an artist, as the shoes were to last for over 1,300 kilometres! His luggage? Precious medicines from Piotr Bartchouk, a famous local horseman, who had not mocked when the young officer went to discuss his project with the man. And a few personal belongings tidily packed in the saddlebags of his military saddle. In all, tack and baggage together weighed less than 20 kilograms (45 lbs)! It would hardly have been possible to travel lighter. Click on photo to enlarge Riding Diana and leading Vlaga, Asseyev makes his triumphant entry into Paris with his two Russian mares. It was grey, it was cold. When the trio finally got to Kiev, after losing a lot of time and a lot of strength, it was snowing! Luckily, once they got through the capital, the climate improved and so did the going. It was not bad weather which slowed the travellers down, but other misfortunes – every type of bureaucrat imaginable. At Novgrad-Volynsk (still in Russia), the police suspected the young officer of being an Austrian spy! They retained him for two days “to check his papers” as we would say today. Then there was the problem of crossing the innumerable Central European borders of the time. In this puzzle of Prussian possessions, of provinces reattached to the Austro-Hungarians, and of German Grand Duchies, the Customs officers were everywhere. The formalities had to be gone through on a daily basis, the border controls were never-ending. 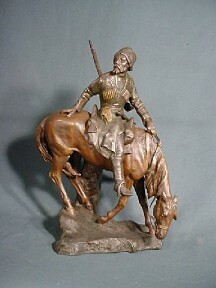 When he arrived in Bohemia, Czech dependence of the old Austro-Hungarian Empire, the Customs officers insisted on attaching some pieces of lead to the horses, which would be removed when they left the country. “And what if they break and I lose them along the way?” Asseyev asked. These small inconveniences were as nothing compared with Asseyev’s constant worry about board and lodging. This was a serious problem every evening. Frequently he had to go from village to village before finally being able to untack, groom, feed and water the mares who had been on the road since dawn. And under what conditions! No doubt that wasn’t very comfortable, but at least it was a good way of keeping an eye on the horses – and ensure they weren’t stolen! These sensible precautions prove that the young officer was both flexible and determined. It was largely due to these qualities that day after day, night after night, kilometre after kilometre, he overcame all obstacles, triumphed over all difficulties, and outwitted all pitfalls. At last, on 19th May 1889, at 2 p.m., the amazing horseman saw the Eiffel Tower in the distance. This had only just been completed, but its distinctive shape was already famous. His heart was beating very fast. He urged on his mares, who incidentally were in the most wonderful shape. And thus at a brisk trot Diane and Vlaga arrived in Paris at exactly 5 p.m. They had travelled 2,475 verstes, or 2,633 kilometres (1,646 miles) in 33 days. It is almost unbelievable: nearly 80 kilometres (50 miles) a day – actually much more if you discount the days when they were forced to wait, as at Novgrad-Volynsk. It was a fantastic exploit, and fortunately Paris celebrated it in style. Asseyev had his portrait painted, was photographed, interviewed. The newspapers were full of him. All Paris wanted him to join them for a meal, they quarrelled over his presence. He was taken to the races in the Bois de Boulogne, he was welcomed at the Military Academy, they took him to Versailles. He was received by the highest military and civil authorities. Congratulations poured in from around the world, and he was invited to all four corners of the planet. Obviously everybody was fascinated by his mares: they were shown at the Universal Exposition. They looked so well, and were in such perfect condition, that the Society for the Protection of Animals decided to honour their owner to congratulate him for the care he had taken of them. In front of a huge crowd (four thousand people!) gathered at the Winter Circus, the President of the SPA awarded the young Russian officer a superb gold medal, while the rafters rang to the tune “God save the Tsar”! You can imagine the patriotic delight with which these words were greeted by a crowd which was also very different from what it would be today. His Majesty the Emperor of All Russia, having read the report which recounted his subject’s exploit, wrote in the margin “Brave young man! A very original journey!” and made him a Sub-Lieutenant in the Imperial Guard in a regiment of Uhlans, after which he was never heard of again.